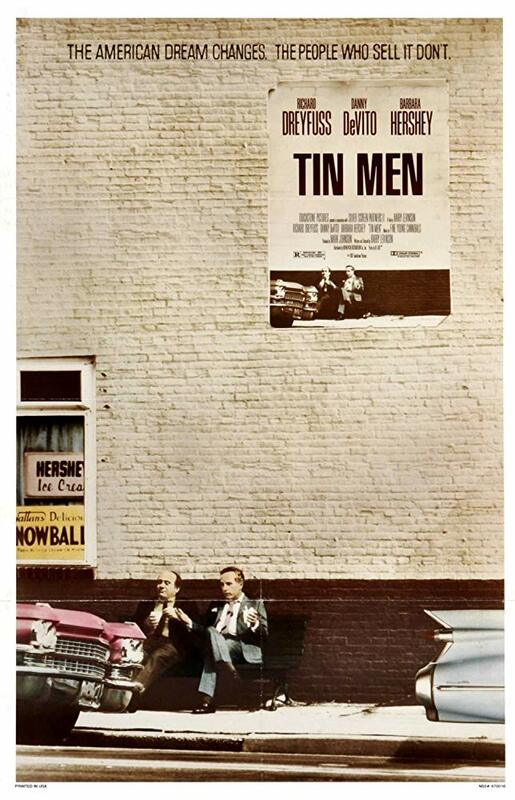 When two rival aluminum siding salesmen (Danny DeVito and Richard Dreyfuss) in 1963 Baltimore accidentally hit each other’s cars, they seek continued revenge. Barry Levinson’s fourth feature film — taking place, once again, in his hometown of Baltimore — suffers from an incurable dilemma: its two lead characters (as well as their “tin men” colleagues) are utterly unsympathetic. In fact, it’s downright uncomfortable watching these hucksters con gullible homeowners into paying for aluminum siding when they haven’t been given anything close to a fair sell. Of course, this is part of Levinson’s point, given that a major subplot of the film revolves around the Home Improvement Commission’s investigation of the tin men’s practices; yet the commissioners are clearly posited as the “bad guys”, and thus, we’re left without a clear side to root for. Similarly, when Dreyfuss shamelessly cuckolds DeVito by seducing his unhappy wife (Barbara Hershey), we’re not sure how to react — especially when the two fall genuinely in love. Are we supposed to root for the happiness of a man as devious and conniving as Dreyfuss? Since he undergoes a sort of character transformation (shifting from self-avowed bachelor to pseudo-family man), he’s supposedly more sympathetic than DeVito, who remains selfish and clueless about his dire straits until the very end — yet DeVito is, ironically, the more compelling of the two con-men. It’s his performance — as well as Levinson’s impressive set designs, and some occasional moments of genuine humor — which keep us watching, even as we cringe at the story itself. No, but it’s probably worth watching simply for DeVito’s performance (which Peary nominates for an “Alternate Oscar” as one of the best of the year). First viewing. In agreement with the spot-on assessment: not must-see. Aside from the fact that this is now a somewhat-difficult movie to track down, the main reason I hadn’t seen it previously is that I’m rather indifferent towards Dreyfuss and DeVito as performers (to me, they tend to come across as go-getters who nevertheless aren’t all that compelling on-screen and they tend to lack nuance, so they lean toward being the same, in a bland way, from film to film). The film itself is fine – for what it is; it’s competently made and the script’s construction is ok. It’s a bit of a downer, though it does its best to work against that. …When it comes to a film like this (i.e., something so focused on male competition in business – like ‘Glengarry Glen Ross’, etc. ), I start wondering about the percentage of female viewers who would be drawn to it. Not that women (esp. in business) are never competitive – but there seems to be something so specifically (alpha) male going on here.